GREAT TO HAVE IF YOU'RE RESTORING A 1976 PONTIAC. DEALER ONLY ALBUM THAT SALES PEOPLE USED. HAS EXTERIOR COLORS, INTERIOR TRIMS AND UPHOLSTERY SAMPLES SWATCHES-ACTUAL FABRIC SAMPLES AND NOT PRINTED IMAGES. One of the nicest 1958 Pontiac showroom albums you will see. Lightly used. Fabric samples are equally as nice as the paint samples. The large portion that shows the actual car models is super nice. 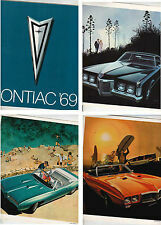 One set of five1968 model year promotional prints from Pontiac with specification sheet. Prints are 24" long by 13.75" high. G8 Sedan & G8 GT Sedan trim levels. 2008 Pontiac G8. I bought this when I had my Catalina drop top, put it away, and forgot about it. As you can see in the pictures, it's in great shape for being 47 years old. Solstice, G8, G6, G5, Vibe & Torrent. 2009 Pontiac Full Line. Exterior paint & interior color samples. 2001 PONTIAC AZTEK SHOWROOM AUTO SHOW FLYER HANDOUT FACT SHEET. Color and upholstery -- examples of the paint and upholstery. However, they are often the only source for hard-to-find upholstery swatches - these are actual fabric samples and not printed images. Includes a photo of each type of interior. Pontiac Motor Division. Regress Press. General Information. Options & Accessories. Color and upholstery -- examples of the paint and upholstery. However, they are often the only source for hard-to-find upholstery swatches - these are actual fabric samples and not printed images. You also get samples of vinyl roof materials and carpet samples. Color and upholstery -- examples of the paint and upholstery. However, they are often the only source for hard-to-find upholstery swatches and samples of convertible top covering. These are actual fabric swatches and paint samples, not printed images. 1966 Pontiac Sales Manual Dealer Album GTO Bonneville Grand Prix Catalina Etc. 1966 Pontiac Catalina. 1966 Pontiac Catalina 2 2. 1966 Pontiac GTO. 1966 Pontiac Bonneville. 1966 Pontiac LeMans. 1966 Pontiac Star Chief Executive. 1966 Pontiac Tempest Custom. 1966 Pontiac Star Chief. Pontiac Division. Regress Press. General information. Performance Chart Engine. Options & Accessories. ORIGINAL 1981 PONTIAC PHOENIX OWNERS MANUAL. VERY GOOD CONDITION. These were the brochures you could pick up in a Dealer's showroom. Great photos, etc. and a nice addition if you own a 98 Firebird, Formula or Trans Am. For sale is a nice used origonal, full color sales brochure covering all models of 1955 Pontiacs. Price includes careful s h lower 48 states US. 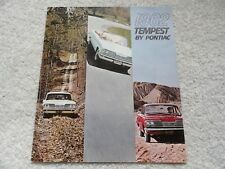 Good original 1966 Pontiac Dealer Accessories Brochure/Catalog. Very Good original 1966 Pontiac Prestige Dealer Sales Brochure. This is a great piece of automotive history that will display very well and will be a good addition to any collection. SE & SSE trim levels. 1997 Pontiac Bonneville. Cover has surface scratches, but otherwise in good condition. 9 1/4" x 10 3/4". 1954 Pontiac Chieftain. 1954 Pontiac Chieftain Deluxe. 1954 Pontiac Chieftain Custom. 1954 Pontiac Chieftain Special. 1954 Pontiac Catalina. Covers all body styles, including 4-door sedan, Catalina, convertible, 2-door sedan, station wagon. Color and upholstery -- examples of the paint and upholstery. However, they are often the only source for hard-to-find upholstery swatches - these are actual fabric samples and not printed images. You also get samples of vinyl roof materials and carpet. 1953 Pontiac Chieftain. 1953 Pontiac Chieftain Deluxe. 1953 Pontiac Chieftain Custom. 1953 Pontiac Chieftain Special. 1953 Pontiac Catalina. You will find out the dealer's "inside information" that is far more detailed than a sales brochure. 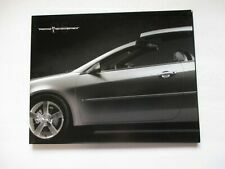 2000 PONTIAC FIREBIRD MODEL SHOWROOM SALES BROCHURE. THIS BROCHURE IS COMPLETE AND IN GOOD CONDITION AND A MUST HAVE FOR YOUR COLLECTION OR IF YOU HAVE ONE THESE VEHICLES. 1997 Pontiac Firebird. 18 page deluxe brochure on the models. Sales Brochure. Sales Brochure Book. Trans Am Coupe and convertible. Formula coupe and convertible. Illustrations and features, color choices, specifications. Color and upholstery -- examples of the paint and upholstery. However, they are often the only source for hard-to-find upholstery swatches - these are actual samples of upholstery. These are actual paint samples and not printed images. Firebird Trans Am GTA. Pontiac 1000. Pontiac 6000. Original Pontiac Dealer Picture Ad Slick 1968 Firebird 8" × 10"
2004 Pontiac GTO Sales Literature new in a protective plastic envelope. What a great gift for that GTO enthusiast (nut). 1955 Pontiac Chieftain. 1955 Pontiac Catalina. Covers all body styles including 4-door sedan, 2-door sedan, Catalina, convertible, 2-door station wagon, and 4-door station wagon. 1955 Pontiac Star Chief Custom. 1969 Pontiac color and trim selector dealer album, nice! This album is in excellent condition and is complete. Very rare! Most of these albums were discarded once the 1970 models arrived. This one has survived in excellent condition. ORIGINAL BROCHURE. Sales Brochure. An excellent literature piece for the enthusiast/owner. (may have slight wear marking associated with storage). VALUE PRICED ! Sales Brochure Book. 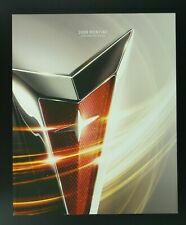 14 page comprehensive brochure exclusive on the model. Sales Brochure. 1999 Pontiac Grand Am. SE, SE1, SE2. Your Source. Out of Cordes Pontiac, Cedar Falls, Iowa. I have had this for years. Decent shape. Original GM printing. 1968 Pontiac Dealer Data Fact Album Brochure Catalog Book-PRICE REDUCED! 1968 Pontiac Dealer Data/Fact Album. Pontiac used to create, annually, a Dealer Data/Fact Album that was available only to dealers. This album is used but in very good condition. 20 pages of all models of the Canadian Pontiacs for 1958. Included are colors, views, features.